The Waiver President Trump's travel ban has been upheld by the Supreme Court. People from the seven banned countries can still come to the U.S. if they get a special "waiver." So far, few people have gotten them. We follow one Yemeni family as they try to get a waiver to escape a civil war. Supreme Court audio in this episode comes from Oyez. MCEVERS: And this is EMBEDDED. UNIDENTIFIED PERSON #1: This is CNN breaking news. WOLF BLITZER: Let's go back to Jessica (ph). The decision has been announced. Go ahead, Jessica. JESSICA: The Supreme Court has reversed the 9th Circuit. What that means is that the Supreme Court is upholding the president's travel ban. MCEVERS: In June 2018, the Supreme Court upheld the Trump administration's so-called travel ban. UNIDENTIFIED ANCHOR #1: Tonight, President Trump's first major Supreme Court victory. UNIDENTIFIED ANCHOR #2: President tweeted this response to the ruling - Supreme Court upholds Trump travel ban. Wow. BENDEREV: Actually, this travel ban is the third travel ban signed by the president. The first one was right after Trump got inaugurated. Remember all those protests against the ban at airports across the country. MCEVERS: A federal court blocked that ban. Then there was another ban - blocked again. And the third ban, as you just heard, was upheld by the Supreme Court, which means that if you're from one of the banned countries - Libya, Iran, Somalia, Syria, Yemen, North Korea or Venezuela - you cannot be granted a visa to the U.S. But there is an exception. And that exception is what we're going to be talking about today. BENDEREV: It's called a waiver. And it means that if you live in one of these countries, but you're not a security risk to the United States, and you would face what's called undue hardship in your country, you can apply for one of these waivers. And then if you get it, you can get a visa and come here. The Trump administration says that these waivers mean there is no Muslim ban. Muslims with a waiver can still get in. And this is actually one reason that the Supreme Court upheld the ban. But other people say that these waivers are arbitrary and really hard to get. MCEVERS: People who seem to meet all the criteria are still getting rejected - sick people, elderly people whose families are already here. And as you're about to hear, for people who live in these banned countries, especially countries that are in the middle of a war, these waivers can be the only chance they have to get out. And what you have to do to try to get a waiver is not easy. BENDEREV: So, Kelly, what is the plan for today? MCEVERS: So I think to really understand the travel ban and to really understand these waivers, I'm going to need to tell you a story. MCEVERS: It's about a man whose family got caught up in the Trump travel ban and who believes his only chance to save his family is to try to get one of these waivers. MCEVERS: So let's start with this guy named Najeeb al-Omari (ph). He's from Yemen. We met him recently. NAJEEB AL-OMARI: I started in - (speaking Arabic). MCEVERS: We talked to him through an interpreter. MCEVERS: He first comes to the U.S. in the '90s. Like a lot of men from Yemen do, he makes his money working in gas stations. MCEVERS: Sends the money back home. He gets married. He has three daughters. MCEVERS: In 2010, he gets American citizenship. MCEVERS: And his plan is to stay in the U.S., keep the family in Yemen. Maybe, eventually, they join him in the U.S. later. But then there are these massive protests in Yemen. The president of Yemen is ousted. And eventually, this militant group called the Houthis launches an attack and takes over the capital of Yemen. This is in 2014. UNIDENTIFIED REPORTER #1: Ravaged by war, Yemen is in the midst of the worst humanitarian crisis in the world. MCEVERS: And it's basically the beginning of the civil war that Yemen is in right now. UNIDENTIFIED REPORTER #2: Amnesty accuses all sides in Yemen's civil war of leaving a bloody trail of civilian deaths, which may amount to war crimes. MCEVERS: So Najeeb - he's still in the U.S. He's starting to really worry about his family, especially about his oldest daughter. Her name is Shaima (ph), and she has severe cerebral palsy. She can't speak. She can't move. She can't eat by herself. And she needs to take medicine four or five times a day to keep her muscles relaxed and to keep her from having spasms. But she's living in this war, so there's a shortage of medicine. MCEVERS: So Najeeb applies for visas for his wife and daughters to come to the U.S. Then in 2016, there's a bombing, like, right near his family's house. OMARI: (Through interpreter) It was a bombing very next to them. They didn't know what to do. MCEVERS: You know, he reached them by phone. They're, like, hiding in the basement. You know, they're trying to, like, stay away from the windows. OMARI: So at that time - after that bombing, he decided, they need to be with me. MCEVERS: And Najeeb's like, I have got to get my family out. PRESIDENT DONALD TRUMP: We put out a statement a little while ago, and these people are going crazy. MCEVERS: ...Donald Trump is campaigning for president. TRUMP: ...Of Muslims entering the United States. MCEVERS: ...And then he gets elected. And a few days after he's inaugurated, he announces this thing called the travel ban. TRUMP: I'm establishing new vetting measures to keep radical Islamic terrorists out of the United States. UNIDENTIFIED REPORTER #3: The president has ordered all travelers from Iran, Iraq, Libya, Somalia, Sudan, Syria and Yemen to be denied entry to the United States for the next 90 days. MCEVERS: And - right? - it's the first weekend after the inauguration. BENDEREV: Oh, my gosh, yeah. UNIDENTIFIED PROTESTERS #1: (Chanting) Let them go right now. UNIDENTIFIED PROTESTERS #2: (Chanting) No justice, no peace. UNIDENTIFIED REPORTER #4: ...Had spread to airports from coast to coast Sunday. MCEVERS: And Najeeb - remember this man from Yemen who's trying to get his family out - now his family is a target of this ban. At this point, Najeeb is living in San Francisco. He's working at a gas station. And after work that day, he actually goes to the airport to protest. UNIDENTIFIED REPORTER #5: Protestors packed SFO's international arrival area near where they believe travelers might be detained. CHRIS RICHARDSON: I think that it was a few days after the inauguration, and we all received this cable full of kind of misspellings and loopholes, and it made no sense. And I think a lot of us were understandably at that time outraged. MCEVERS: This is Chris Richardson. He used to be a consular officer in the State Department at an American embassy overseas. And the reason I'm introducing you to Chris Richardson is because he's the kind of person who decides whether or not Najeeb's family gets to come to the United States. BENDEREV: Like, what do you mean, he gets to decide? MCEVERS: Like, he's the guy who would meet Najeeb's family in an embassy overseas, review their application for a visa and decide whether or not to accept it. BENDEREV: ...People who want to immigrate. BENDEREV: So, Chris Richardson - he does not like this ban. MCEVERS: He does not like this ban. RICHARDSON: We knew it for what it was. I think that they wanted to meet this promise of banning Muslims as soon as possible and sort of ram it down our throats. MCEVERS: Chris says not everybody in the State Department felt this way, but some people felt so strongly that they put together something called the descent cable. This is where people across the department write this, like, collective letter to Secretary of State at the time, Rex Tillerson, saying, we disagree with this. RICHARDSON: There had been officers who had talked about doing walkouts. There had been officers talking about, you know, wearing certain clothes in protest because, at that time, we were all pretty shocked and outraged by it. MCEVERS: Because they were going to have to be the ones to enforce it. You know, they were the ones who were, like, on the front lines of enforcing this thing that some of them didn't agree with. But then they learn pretty quickly that if they do that kind of stuff, they'll get fired. RICHARDSON: We got word that a lot of the things that we wanted to do actually would permit the administration to immediately fire us. And so if we did a walkout - for example, we were told by our union that, you know, if you do a walkout, you guys might lose your jobs. MCEVERS: ...Until they get the visas. And then they can all come to the U.S. together. But the thing is it is not easy to get into Yemen. I mean, Yemen's in the middle of a war. The main airport in the country - in the capital - is closed, has been closed for a long time. And the other airport is in the south, but Najeeb's family lives in the north. So to get from that airport to his house, he's basically crossing a frontline in this war. And there's checkpoints all along the way. You never know who's controlling each one. Eventually, Najeeb gets home, and he's back with his family. And the next thing that happens is he gets an email from the United States government, and it says the family needs to provide proof of medical exam - proving that family has the right vaccinations, stuff like that. But to do that, Najeeb is going to have to go to Djibouti. It's the nearest country to Yemen with a U.S. embassy that's open. BENDEREV: So Djibouti - how far away is that? MCEVERS: It's across the Red Sea from Yemen. It's about an hour flight away. So Najeeb piles the family in a car to make the drive from his city, Ibb, to the airport, Aden - again, basically crossing the front line of this war. And so our producer, Tom Dreisbach, asks about that trip. TOM DREISBACH, BYLINE: And how long was the car ride from Ibb to Aden? OMARI: The mountain - almost 15 hours. MCEVERS: He says the drive was really hard for Shaima, Najeeb's oldest daughter, who has cerebral palsy and can't speak. OMARI: (Through interpreter) She was exhausted, trying to get some nap and sleep, but she couldn't because of, like, the bumping in the road - broken. And she was, like, crying, screaming. MCEVERS: They find out that the Houthis have launched an attack on Saudi Arabia, and the airport in Aden is closed. So it's about a month before the airport reopens, and they can finally fly to Djibouti for the medical exams. They actually have to fly from Yemen to Sudan to Ethiopia to Djibouti. MCEVERS: And Shaima - the thing to know about Shaima - she doesn't have a wheelchair. They carry her wherever they go. So they get to Djibouti, and they take Shaima to a clinic, and it's not cheap. You know, I started to think when we were talking to Najeeb - like, how much money has this whole saga cost them? HUSSEIN: Only in Djibouti, $25,000 - only in Djibouti. MCEVERS: ...Saying they have an appointment for an interview. HUSSEIN: This was from the embassy, hey, you know, so yeah. MCEVERS: Yeah, it's a big moment. MCEVERS: And there's another big moment happening back in the U.S. We're in late 2017 right now, and what's happened is the third travel ban has been announced. And eventually, it goes to the U.S. Supreme Court, which rules that the ban can stay in effect until it hears the case. And now, at this point, part of the ban is that people can apply for these waivers. But the problem is nobody knows exactly how these waivers work. Like, there's no form to fill out to say, I'm applying for this waiver. Instead, if you're from a banned country, you still apply for a visa. And you automatically are considered for a waiver. And to get a waiver, you have to meet these three criteria. And the criteria are quote, "One, denying entry would cause the foreign national undue hardship. Two, entry would not pose a threat to the national security or public safety of the U.S. And three, entry would be in the national interest." And Chris Richardson says in order to get a waiver, not only do you, the consular officer, have to approve it. Your consular manager in the embassy has to approve it, and then Washington has to approve it. BENDEREV: Oh, it's got to go all the way to D.C.
RICHARDSON: Between 70, 80, 90, 120 applicants a day, maybe even in a single morning. And so, basically, an applicant has 5 minutes. MCEVERS: And so to push someone through those layers of bureaucracy - right? - there's no incentive to do that. RICHARDSON: You know, during review time as an officer, you can't say, well, the reason why I did 40 visas, and my colleague did 90 visas is because I tried to issue as many waivers as possible. You know, everyone's going to look at you like what? (Laughter). You know, they're going to look at you like you were some kind of do-gooder hero, but that's not going to help you move up in the State Department. MCEVERS: And it's not long after this that Chris Richardson actually quits his job. He decides he can do more good on the outside talking about all this than he could do on the inside. RICHARDSON: I ultimately believe that, you know, this decision by this president will go down as a black mark on American history. And I want it to be known to my son one day and my family that I tried to do something about this. I might not be successful, but at the very least, not only myself but - and I can speak for other consular officers - that we didn't go and support this without fighting, both internally and externally. MCEVERS: Again, not all consular officers feel the same way as Chris. He says some of them who originally opposed the ban actually came to believe they could work with it over time. So for Najeeb, going into this visa interview, this travel ban is now in place. Yemen is on the list. To get the visas for his wife and his daughters his family is going to have to now qualify for a waiver. So the appointment is in early 2018 at the American Embassy in Djibouti. And Najeeb is still really confident they're going to get this waiver, or as he calls it, an exception. HUSSEIN: He was so happy, and he was really optimistic because the lawyer assured for him that everything is going to be fine. Don't worry. You are exception. MCEVERS: It's a waiver, right. MCEVERS: Everybody got dressed up. They all go to the embassy. He's carrying Shaima in his arms. MCEVERS: He watches as two families and an old woman go in for their appointments and come out and say they all got rejected. HUSSEIN: Although, he's still keeping the hope, saying, I'm OK.
MCEVERS: So Najeeb's time comes up. He walks into the consulate's office, and the consular officer is looking at the application for the family. At first, he looks at the youngest daughter's application. She's 5. And she was born after Najeeb became a citizen, so the consular officer is like, she's fine. She's already a citizen. And then he looks at the other two daughters, Shaima, who's 10, and Selwa (ph), who's 7 - and at the mother's application. And the consular officer says, the rest of you are rejected. We are under a ban. And then he says it in Arabic, a presidential decision. HUSSEIN: Just want to make sure that he understood the whole thing. MCEVERS: Like this American guy says it to Najeeb in Arabic as if to just make sure it's very clear. Almost like, it's not coming from me, it's coming from the president. BENDEREV: How long was the meeting at the consulate with the official? HUSSEIN: When he left, he was really in a terrible situation. And the kids were crying. And he was like really disappointed. He didn't know what to do. MCEVERS: Najeeb is just totally surprised. I mean, he's just completely shocked, devastated. But the thing about Najeeb is like he's like, all right, what's next? Go back to the apartment, try to figure out a plan. MCEVERS: At this point, Najeeb al-Omari's wife and daughters have been rejected for a visa to the United States. And Najeeb does two things. A friend puts him in touch with a group of lawyers who represent Muslim-Americans. Najeeb tells them his story. And then the lawyers put his story into an amicus brief - that's a friend-of-the-court brief - that they're filing in that Supreme Court case that's going to determine whether or not the travel ban stands. Trump v. the state of Hawaii. And then the second thing that he does is he starts talking to reporters. MCEVERS: He gets interviewed by Al-Jazeera. HUSSEIN: Najeeb thought that given Shaima's condition and the fact that he's an American citizen, they would qualify for a waiver. MCEVERS: ...The Supreme Court of the United States hears oral arguments in Trump v. Hawaii. UNIDENTIFIED JUDGE: President of the United States v. Hawaii. MCEVERS: Two days later, Najeeb reads an email from the United States government. The email is actually from that same consular officer who did their interview. And the officer says that during the interview, it was clear that Shaima did, in fact, have cerebral palsy. And then he writes, I determined the very same day that your family's case clearly met the standard of hardship, and I therefore recommended your family for a waiver. However, I could not inform you of this at the time because under department rules, the waiver still required review from my supervisor. But, he writes, the waiver was approved. And as of today, April 24, 2018, your family's case is still in administrative processing. This is April 24. It's actually the day before oral arguments in the Supreme Court. Najeeb just didn't read the email until April 27. BENDEREV: So what does that email mean? MCEVERS: What it means is the consular officer is saying, we made the decision to grant you a waiver. It's going to take a little more time to actually get it. But you're going to get a waiver. MCEVERS: It's a strange email, right? Because Najeeb's family had already been rejected in this one-on-one interview with the consular officer. And then he gets this email which seems to totally reverse that decision. MCEVERS: We tried to get clarity from the State Department on this. They say they don't comment on people's individual cases. And so the point is this should be good news for Najeeb. It says his wife and daughters have been recommended for a waiver. But here's the crazy thing - Najeeb doesn't believe it. He just reads the email like, oh, they're just trying to save face. Najeeb at this point is just really devastated. He does not think the family is going to get the waiver. OMARI: (Through interpreter) I lost hope totally. It was like all the doors are closed in front of me. And Shaima - her case is getting worse. MCEVERS: ...I'm just going to take the family back to Yemen. Even though there's a war there, I'm just going to try to make a life for now. BENDEREV: So now he's back in Yemen. MCEVERS: A month later, they get a phone call. HUSSEIN: He received a phone call from the American Embassy in Djibouti. MCEVERS: That's Najeeb's wife Asma (ph). MCEVERS: And you can hear an interpreter talking to them, speaking to the family in Arabic and then speaking to someone in the U.S. Embassy in English. MCEVERS: The call is super confusing. Let me try to explain. It happens on May 17, 2018. And what they're saying to him is, your medical records will expire on May 29. MCEVERS: You need to go to the United States before May 29. MCEVERS: What's happening here is it sounds like they're going to get the visas, but no one's saying that. Like, they're not saying, congratulations. OMARI: (Through interpreter) He didn't mention clearly that you got the visa. He mentioned that you need to come and enter the States before the 29. MCEVERS: And our interpreter tells us that the interpreter on the call is like - he kind of wants to tell Najeeb's wife, you've got the visa. But he can't tell her. I mean, this is what our interpreter thinks is happening. MCEVERS: So one more time. Drive from Ibb to Aden. This time, they'd luck out. They get a direct flight from Aden to Djibouti. They get a message, like, when they land. HUSSEIN: ...Saying, right now leave everything and go to the embassy. Right now. MCEVERS: ...Meets the same consular officer that they met before. OMARI: (Through interpreter) The same one of the first meeting. MCEVERS: We reached out to this officer to confirm some of the details of this case, but he did not respond to our email. And so the consular officer tells Najeeb there's one little thing that he has to change in his application. OMARI: (Through interpreter) And he asks him, where are the passports? And he said, these are the passports. He said, that's all I need. MCEVERS: I'm like - to Najeeb, I'm like, did you say anything to him? OMARI: (Through interpreter) Nothing. No more than - not a letter more. MCEVERS: He's like, not a letter more than I need to. MCEVERS: ...Najeeb, Asma, Shaima, Selwa and Lamia (ph) land at JFK. MCEVERS: A lot of people from the Yemeni-American community and the immigrants' rights community are there to welcome them with presents and balloons and American flags. A month later, the Supreme Court upholds the travel ban. President Trump gets what he wanted. People from seven countries are banned, and what many say is a vague and arbitrary waiver program is here to stay. Shaima's case is mentioned in a dissenting opinion by the court. It was written by Justice Breyer. And he says it appears that Shaima got the waiver because of the international attention to her case, which he says is, quote, "more reason to believe that waivers are not being processed in an ordinary way." He also says even though the administration said it would provide guidance on how to get waivers, there still is no guidance. Like I said, there's no form to fill out and apply for a waiver. And a lot of people in banned countries don't even know there is a waiver. We should say we reached out to the White House to comment on all the criticisms of the waiver program, but we did not get a response. BENDEREV: Do we know how many of these people that might be eligible for a waiver are actually getting one? MCEVERS: According to the State Department, as of mid-June, 809 of these waivers have been granted out of more than 30,000 applications. MCEVERS: So yeah, Najeeb's family makes it to the U.S., but it's after that weird email in April. What do you think happened? Well, we asked Chris Richardson about this because he's done that job before. He says it's likely that the consular officer in Najeeb's family's case gave them a formal rejection but was actually still pursuing a waiver for them behind the scenes. RICHARDSON: The officer wrote like a personal email like that. That's pretty remarkable. That means the officer really felt strongly about that case and really felt that something had to be done. MCEVERS: And then, Najeeb talks to these lawyers who work for this Muslim advocacy group and becomes part of this amicus brief. And his story appears in the mainstream media. Do you think that could have had an effect? RICHARDSON: Oh, yeah. Oh, yeah. And everyone knows that in State that, you know, sometimes if cases get national or international attention, things that were denials suddenly become approvals. MCEVERS: And if you're one of the tens of thousands of people who have applied for one of these waivers, Chris Richardson says, it doesn't hurt to be mentioned at the Supreme Court. RICHARDSON: We should put all 30,000 names (laughter) in the amicus brief, and maybe everyone will then get a waiver. MCEVERS: Like, their case is the exception, not the rule. BENDEREV: So after all this, how is Najeeb doing? How's his family? MCEVERS: Najeeb and his family are living in the Central Valley in California. And when we were there, his two younger daughters were running around. OMARI: Hello. What's your name? (Speaking Arabic). LAMIA AL-OMARI: Lamia. Lamia al-Omari. MCEVERS: Shaima was in the other room resting. She's stable now. And Najeeb says they're working with an organization that provides services for people with disabilities. And, Najeeb's wife, Asma, just got a green card. And the family has been told that the green cards for the girls are on the way. BENDEREV: What about other people from Yemen, though, what's going to happen with them? MCEVERS: Well, again, we're just not seeing that many people getting waivers. Our colleague at NPR, Joel Rose, had a story on NPR recently. He was talking to this other dad from Yemen who's trying to get visas for his family. And he talks about how hopeful he and everyone else had been because of Shaima's case. Like, they all know her name. UNIDENTIFIED PERSON #3: I don't know if you know about Shaima, the little girl who - they gave her a visa. MCEVERS: And even though their cases aren't related, Shaima getting the waiver made them think that the Supreme Court might rule in their favor - but, of course, it didn't. And now it just feels so final. People have less hope than before. MCEVERS: This story was reported by me, Chris Benderev, Noor Wazwaz and Tom Dreisbach. It was produced by Chris, Noor and Tom. It was edited by Lisa Pollak with help from Neal Carruth, Gerry Holmes and Mark Memmott. Our lawyer is Ashley messenger. Our theme song is by Colin Wambsgans, other original music by Ramtin Arablouei. Supreme Court audio in this episode is from Oyez. Big thanks to our interpreter, Dalia Hussein, and to NPR's Joel Rose, also to Monica Velez and Shirin Assemi of Valley Public Radio, Patrick Garrett of member station WAMC and Sean Powers of Georgia Public Broadcasting. 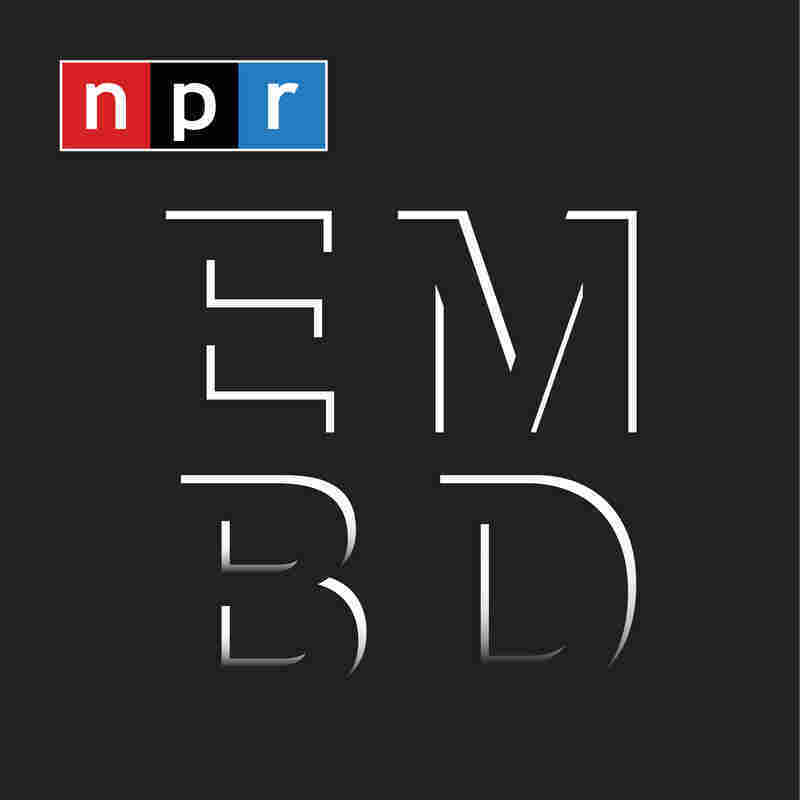 EMBEDDED is executive produced by me, Anya Grundmann and Chris Turpin. Subscribe to this podcast, if you haven't already. Holler at us on Twitter @nprembedded. That's it for a while. We'll be back soon with more.